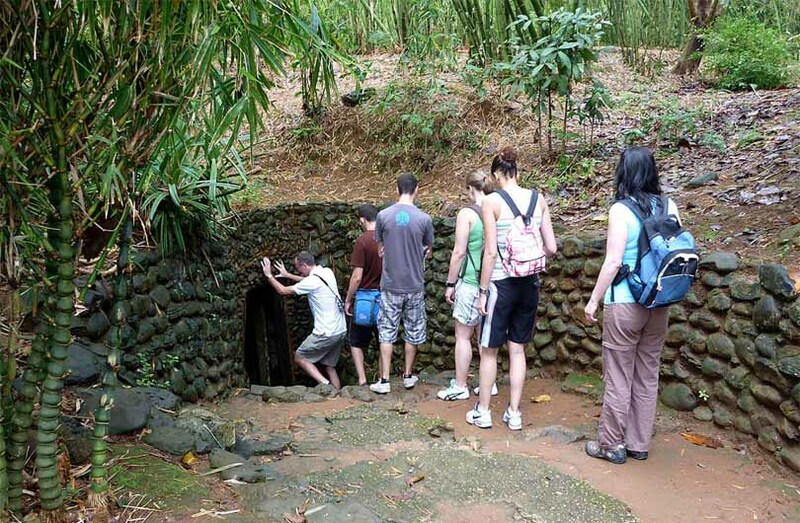 The ben duoc cu chi tunnels full day tour is designed to take in a different direction to the typical tourist route, as we divert from the crowds and specially constructed tunnels of ben dinh, and visit the unchanged ben duoc site preferred by the locals. 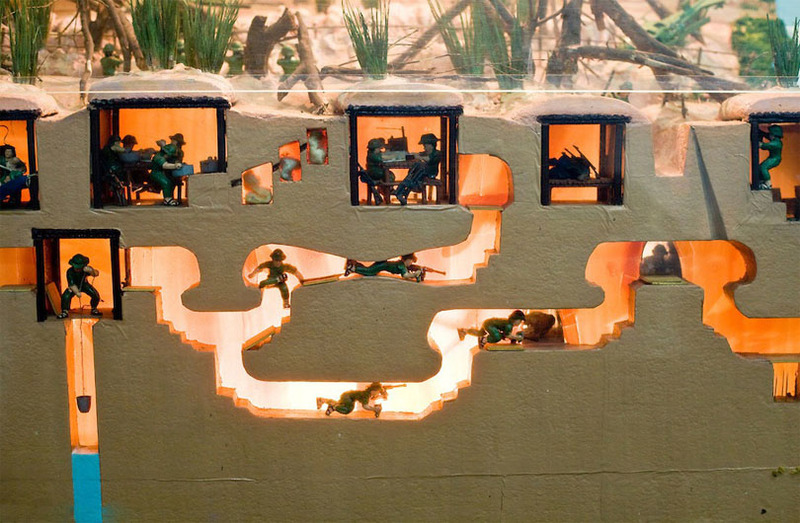 Part of a complex system of underground passageways built for daily-life as well as military strategy, the Cu Chi tunnels celebrate the skill and ingenuity of the Vietnamese people in overcoming incredible odds. Drinks, meals and any other incidental expenses not mentioned above. 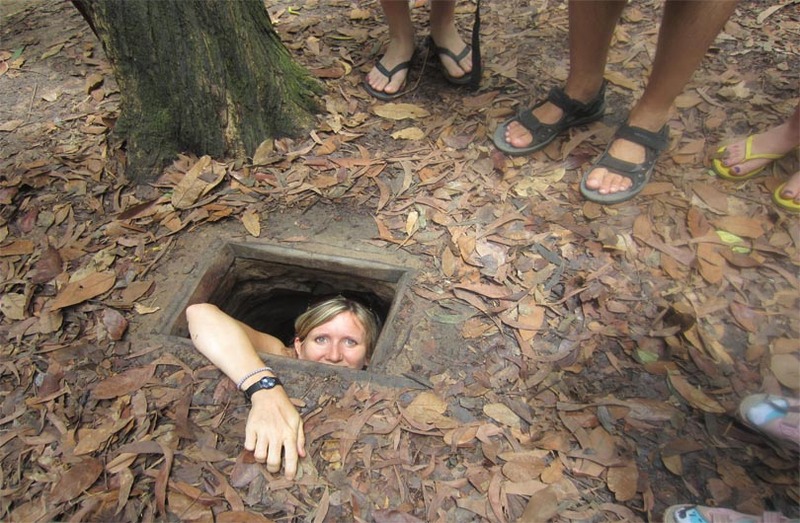 At 8:00 am our Cu Chi tunnels full day tour begins with a two hour drive through the modern mayhem of hectic Ho Chi Minh city, into the rustic rurality of Cu Chi district. Don’t let the long drive scare you though, as along the way we’ll keep you entertained with tales about the area’s turbulent history, about the lives and grinds of its people, and even the music they listened to. Just 30 minutes further from the typically-visited Ben Dinh tunnels will find us in Ben Duoc tunnels; the site other tour companies tend to avoid on account of the extra distance. 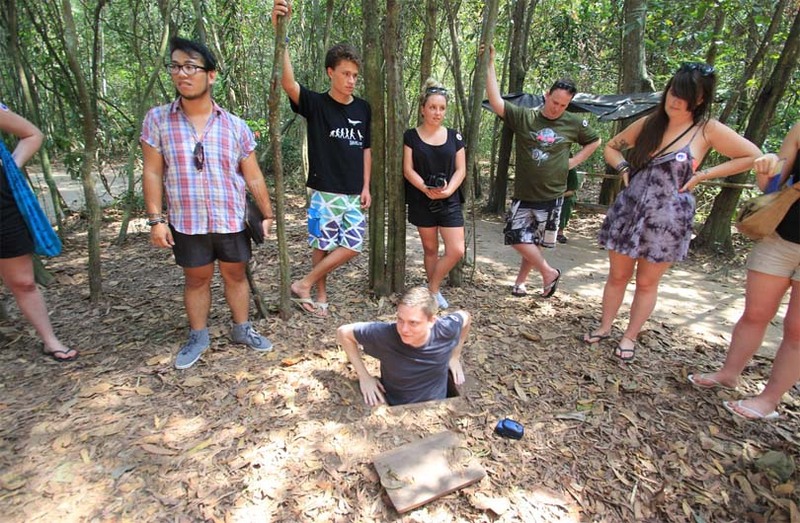 Here, you’ll learn what life was truly like in these enemy-named ‘black echo’ mazes, as we guide you through the historic grounds – and into the underground Cu Chi tunnels, if you dare! Model-homes and display areas not seen at the Ben Dinh tunnels teach of daily lives and survival means, and an ornate memorial temple commemorating those who died make this site particularly enlightening. Our visit to the infamous Cu Chi tunnels would not be complete without a narrated tour into the country’s cuisine. Relax by the riverside and enjoy a scenic lunch of the kind eaten in the area for centuries, as your native, English-speaking guide explains the cultural significance of each particular dish. Learn too about how modern-day Cu Chi is affected by its complicated past; how the rural lives of the region’s people have changed since the days of the American War. With all the insight you could hope for on the area, we’ll make our way back to Saigon on a different route to which we came, arriving at your hotel at around 4:30 pm. At Detoured Asia, we believe the Cu Chi tunnels to be one of the most historically interesting sites in the country, and deserving of a more in-depth, authentic look than the type usually offered to tourists. This is why our full-day, private tour guides you through the better resourced, alternative site of Ben Duoc tunnels where, unlike the tourist-packed Ben Dinh site, the tunnels are not re-sized for foreigners. With plenty of time to stop and take in the history, we’ll show you the many and varied reasons the Cu Chi tunnels are an important symbol of human resilience, and Vietnamese courage in the face of adversity. Note: we only run private and customizable tours. 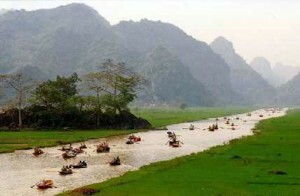 In addition, for a leisurely way to approach the network of tunnels, we recommend a join-in half day tour Cu Chi Tunnels by Speedboat via Saigon River. 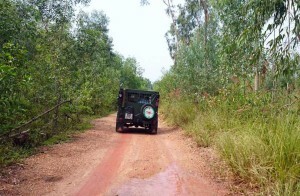 This Cu Chi tunnels tour is not to be missed. Joseph was young, Vietnamese, and incredibly knowledgeable about the Vietnam war. We went to Cu Chi tunnels a few days ago and saw the editorialized version of history, it’s safe to say that Detoured Asia company maintains a much more accurate version of the war and its effects. The Ben Duoc site of the Cu Chi tunnels is about an hour further from HCMC than the Ben Dinh site, which means it is far less crowded and a more relaxed and informative visit. We saw none of the big tour buses which seem to overwhelm Ben Dinh and never felt rushed or crowded. 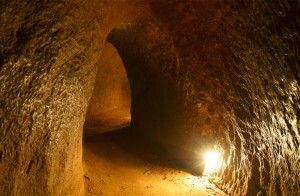 The Cu Chi tunnels themselves are fascinating, as others have indicated already. Only a small portion of this experience involves moving through the tunnels, and you have to hunch over and almost duck-walk through, as the tunnels are 3′ to 4′ high. People with bad backs, bad knees or claustrophobia may want to skip this element of the visit, but by no means does that mean you should avoid the Cu Chi experience. Most people scoot through a short section that takes maybe 2 or 3 minutes, while one can easily spend 2 hours visiting the site and its exhibits. At Ben Duoc many of the visitors are Vietnamese, as opposed to the foreign faces more prevalent at Ben Dinh. Both have shooting ranges where visitors can pay to fire off rounds from AK-47’s and M-16 rifles, but be aware that the cost is on a per-bullet basis (expensive if you use an automatic setting) and also make sure that the hearing protection they provide fits tightly. I did not do so, and had tinnitis for a few months after this visit. Our family of five had a private minivan tour from our hotel in HCMC, and we opted to make it a full day tour by going a further 20 approx. 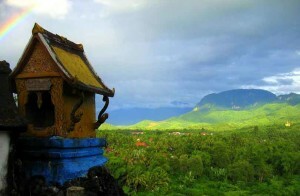 to the west of Ben Dinh and visited the Cao Dai Holy See, located at Tay Ninh. This is a fascinating, eclectic, multicolored, flamboyant (some might say garish) modern temple which holds daily Buddhist-inspired services that are interesting to watch. The Cao Dai religion is a twentieth century Vietnamese invention merging Buddhism, Taoism and Confucianism that takes its organizational cues from the papacy and the Vatican. On a combined tour, your guide will schedule things so that you will be able to see the worshippers, robed like Buddhist monks, in their daily service, from viewing galleries. Flashless photos are permitted. 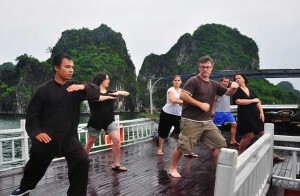 I’d recommend doing this along with the Cu Chi tunnels and making it a full day trip out of HCMC.